I finished a new pair of socks yesterday. They are, of course, plain stockinette with a picot cuff. And they are very bright. The yarn is Sunshine Yarns Twist Sock Yarn in the color Weasley’s Wizard Wheezes. I think it pools in a wildly fantastic way. This is my 8th pair of finished socks in 2009. That may sound like a lot but my goal for the year is 18 and the year is almost half over. I have some catching up to do. They are bright, yes … but appropriately so for socks named after Fred and George! Will you wear them to the movie when it comes out this summer? I love the pooling also – very fun! And if you are a slacker at finishing 8 pairs…..I don’t know what I am except I guess scared to get started on one pair. It takes a yarn that outrageous to make pooling a virtue. I think they would be perfect socks to wear to a Harry Potter-themed story time. The kids would love them! You are a Sock Machine! Great socks, great colors – fun! Fantastic socks! I love bright socks!! Great name. Your Weasley socks really are wild and I love them! Love the pooling/flashing/colors on those too. Perfect for a rainy day. 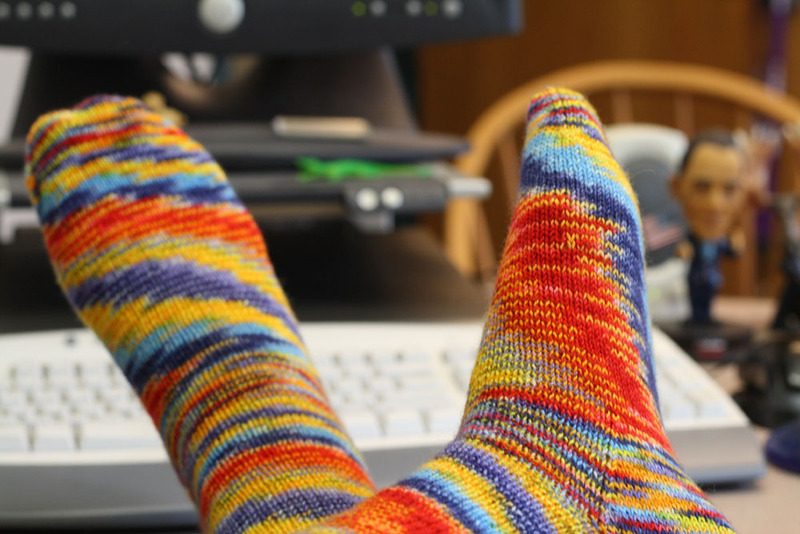 Your new socks are “something else,” in a good way! Always happy to see another HP fan; we are waiting very impatiently for July 15 and making do with rereading the series from Book Four, on. Do you or anyone you know have use for two bagsful of unwashed Dorset fleece? It’s nice — soft, wooly, redolent of grass and lanolin. I collected the bags from a neighbor (well, the neighbor’s sheep) for someone who said she wanted it, then didn’t. Fantastic socks. Remind me of fire. Slacker?? nah. I’m with gale (above). You have too much energy and I feel like the slacker. Happy Almost-Friday! 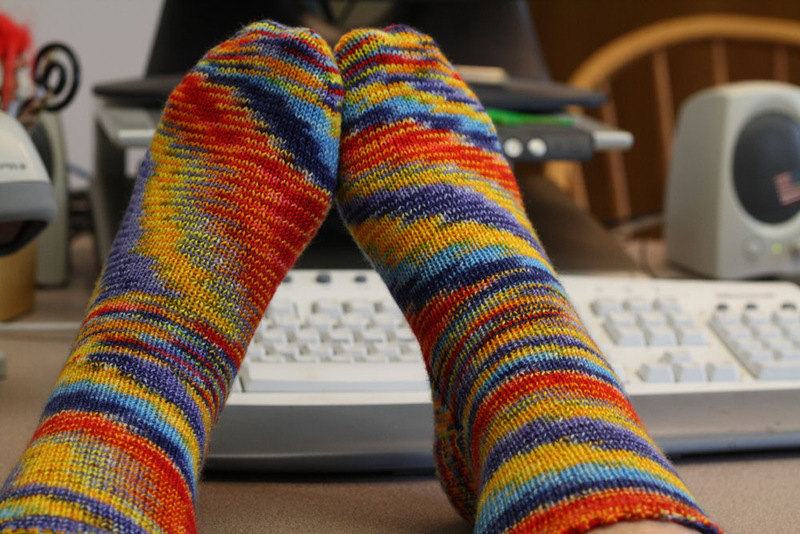 I love love love the yarn you used for the socks! So bright and cheerful! Love ’em! And slacker was JUST the word I was thinking of to describe you! Very colorful ! Love the picot edge! akward, but I don’t know if it’s me not liking it or the newness? small town town called Rochester. I wish I could be as accepting about pooling/flashing. I don’t mind it in other people’s socks but hate it in mine. Fussy or what? Love the colors in yours though. Maybe you should make some anklets next to show off that tatt? Perfectly psychedelic! I think that’s the best kind of pooling I’ve seen. I LOVE these socks and the pooling and all. GOod for you and your sock goal! Im with Carol who thinks you should knit to show off that gorgeous tatt. I say a beige/skin color so you only see the tatt! I love those!!! You can knock out another pair before the end of June, and then you’ll be right on track! I love the new socks. I think socks are a way to express our wild nature without having to dress like clowns. 🙂 As for slacking? If you’ve done 8 and your goal is 18 and the year isn’t half over, I think you’re right on schedule. Me, I’m happy if I can produce 3 pair of socks per year. I’m on pair number 2 and feeling pretty good about it. Those are some bright socks! Slacker! Good thing the Summer of Socks is right around the corner. Those are indeed very bright, but purty! What Julie said. Unless you don’t finish a 9th pair by the end of the month, you’re not a slacker in your quest for 18 this year. What the HELL will you do with 18 MORE pairs of socks? (Hee.) Honestly, I only have about … I don’t know…. six pairs or something…and that is way more than I need. I guess you have a right to collect ’em for no good reason, though. Um bright, yes but in a good way. Not like certain other socks. They do look very cool. Carole, those are awesome. Did you just love knitting with Sunshine Yarns? She is my new favorite! These are truely the socks that can snuggle up to that newly enhanced tattoo! As for tat socks, you could fair isle a pair to match the tat. Awesome socks! I love bright sock yarn! I feel like a slacker compared to a lot of knitting bloggers. But I am OK with that. Am I spotting an Obama bobblehead on your desk??? I love it! 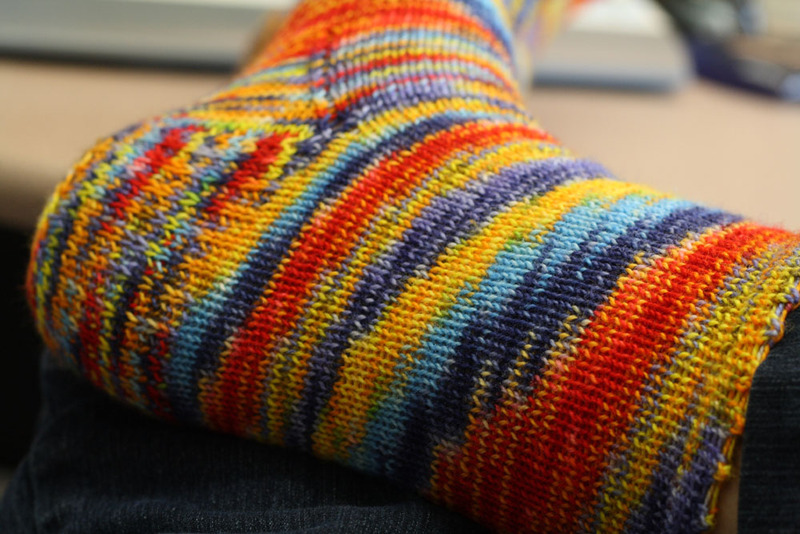 I’m amused by the fact that it pools everywhere except around the ankles, the reverse of most multicolored sock yarns. Great socks! You are a terrible slacker — says she who has completed not a single pair this year. you are a total slacker. first there’s tattoos. then psychedelic socks. and the underachievement. my parents aren’t going to let me hang out with you if this keeps up. I am absolutely in love with those socks! The yarn is terrific. I like the pooling too, and that you just let them, and let them be plain socks. Great crazy colors! Slacker???? Geesh, makes me a slug I guess. love the wild and crazy pooling on these! !